Vicious truly was a book unlike any I've ever read before. This was my first experience with Victoria Schwab - despite having wanted to read The Archived since before it even came out - and I can say with complete certainty that I will be reading everything else this brilliant lady will ever write. Vicious was compelling, dark, addictive and beyond clever. The story stayed with me at all times when I wasn't reading it and once I was done, it just stayed with me for days and days afterwards. I'd find myself musing over certain twists and the truly unforgettable characters, which I consider to be quite the feat! Vicious is a tale of revenge that is flawlessly woven within a ten year time span. The narrative goes back and forth between the present and the past in a way that is addictive and exciting, never confusing or labored. The way the story is put together is truly a feat of sheer genius on Schwab's part and I don't think anyone could have done it better. HUGE props to her for pulling it off anyway, it could have easily been disastrous but it was executed to perfection. I was honestly shaking my head when it was all over, just reeling over all of it. The characters are another aspect of Vicious that made it stand out. There are no 'true' heroes in this tale - at least, not in the way you'd expect. The story is told in alternating POV's which mostly centers around Victor & Eli. Neither of these characters were especially relatable; or even sympathetic, I was surprised by how quickly I became immersed in their world. As the both become obsessed with EO's or extra-ordinaries - people who survive near-death experiences and somehow develop super-human abilities, their darkest ambitions and truest natures come to the surface in a way that is both chilling and engrossing. It was like witnessing the start of a horrible accident and not being able to turn away - not even for a second. And I mean that in the best possible way! The delicious plot & intricate pacing had me glued to the pages right from the start and the more I read the more I needed to know the outcome. I was surprised at how much empathy I felt for one of the MC's and his entourage. With all of the horrible things that were done throughout this story: murders, betrayals, torture, violence and conniving, these characters still came off as entirely human in some way, shape or form. Sure they were despicable and scary at times, but their humanity remained. They all felt that they were doing the right thing and when you understood their pasts and their reasoning for doing the things they did, it was impossible not to feel invested in it all. If I had to sum up Vicious in one word it would be: stirring. This is the kind of tale that lingers in your mind, both when you're not reading it and once all is said and done. Almost a week has gone by now and I still find myself going back to certain scenes in my head. The EO powers are certainly something very new which was refreshing. Despite some super-human abilities, this story reads more like realistic fiction than straight up paranormal story. Everything seemed so plausible throughout, and the way certain individuals ended up with their specific power was super eery! 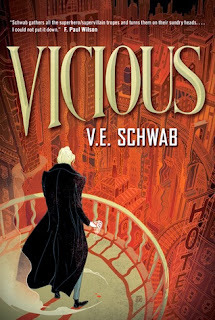 I'd recommend Vicious to adult readers looking for a delicious revenge story or fans of Victoria Schwab. Everyone's been raving about Vicious. I really want to read it, but I'm not sure it's my type of book. Seems like a memorable book for you, though. Glad you enjoyed it! I really wasn'T sure it was going to be my thing either but I'm so thrilled by howit took me by surprise and won me over :D Thanks for the comment Christie!! I haven't read anything by Schwab yet either, though The Archived sounds amazing and I'm definitely going to buy the paperback when it's finally out. Oh YAY! So happy to hear you enjoyed your first Victoria Schwab book! I know I enjoyed my first one (The Archived) immensely. And you mention all the same things about her writing that I felt when I read The Archived! She was just so tremendously skilled at handling complex storylines and interweaving past and present points of view. I'm not surprised you found the same to be the case with this one! Well, I was pretty excited about this one before, but now I'm even moreso if that's possible!! It's so rare that I read adult books, but I would absolutely make an exception for Victoria Schwab. I'm also DYING for the sequel to The Archived (which had an amazingly unique concept and you should absolutely read it, by the way!)! Really fantastic review!! I can NOT wait to read The Archived now! I'd had it on my wishlist/TBR since it came out but now that I've read Vicious, my need for it has doubled :D And now your comment here is making it even worse...in a good way haha!! I can't wait to read this one! I just finished Victoria's other book The Archived and I really enjoy her writing. Your review has made me want to read it even more.